One of the most important aspects of your job is acting as the liaison between the employer and its workforce. And when employees come to you with feedback and/or concerns, it's critical their reports are taken seriously. As an HR professional, it’s your job to share these issues with appropriate members of the leadership team and ensure they take the necessary action — especially in cases of harassment, discrimination or other abuses of power. But if an employer chooses to ignore their employees’ concerns and fails to take action to correct these toxic behaviors, it’s probably best to move on — and maybe even report them to the Equal Employment Opportunity Commission (EEOC) or another appropriate government agency. Nearly every HR professional can recall a time when a coworker brushed off (or laughed off) an important rule or regulation. Too often, employees assume regulatory compliance is merely busy work or unnecessary documentation — usually because they aren’t as familiar with employment laws (or the penalties associated with not following them). In most cases, educating the leadership team and workforce on the importance of compliance will help eliminate negligence and carelessness. But when failure to comply with critical regulations becomes the norm rather than the exception, you may feel like you’re fighting a losing battle. If your employer routinely breaks crucial policies and ignores your requests for compliance, it may be time to take your talents elsewhere. You work hard to help your employer attract and retain top talent, and sometimes this means helping to institute new policies and employment benefits, like remote work, flexible hours or unlimited vacation time. Because part of your job is staying abreast of what’s happening in the world of employment and recruiting, you have the insider knowledge to help your employer stay competitive. Unfortunately, not all leaders are open to change and may even balk at your suggestions to offer more modern perks. If you feel this resistance to change is impacting your ability to find and hire talented professionals, consider seeking an employer who is more open to your expertise, and who is committed to improving recruiting and retention. HR leaders are often charged with helping to improve company culture and boosting employee satisfaction. In many cases, this means developing new employee recognition programs, enhancing transparency and creating more opportunities for employees/teams to bond and connect. Of course, these efforts require buy-in and commitment from the executive leadership team as well as all department leaders and managers. Toxic company culture is usually the result of ineffective leadership. If your company’s workforce is plagued by burnout, poor attitudes, inefficiency and interdepartmental drama, and leaders are resistant to the efforts you’re making to improve the workplace environment, it’s unlikely that it will get much better. Continuing to grow your skill set and staying up-to-date on employment trends and best practices are essential to success in human resources. From earning new HR certifications and attending industry events to staying current on federal and state policy changes to learning new software, you rely on education to ensure you remain effective at your job — and advance to new levels of your career. A great employer will support your career development endeavors by investing in your ongoing education and making it easy for you to access the skill-building experiences and materials you need. They recognize these efforts will not only benefit you, but the organization as a whole. If your current employer doesn’t offer career development or career advancement opportunities, keep in mind that there are others who will. Working as a human resources professional has numerous advantages. From building relationships with employees across all departments and helping them overcome workplace challenges to creating lasting change through organizational policies, there are many ways to make an impact as an HR leader. But not all employers treat HR professionals with the respect they deserve. If you feel like your employer is failing to leverage your skills, is preventing you from achieving success and/or is limiting your potential (as well as the potential of the entire organization), it’s time to consider a career move. 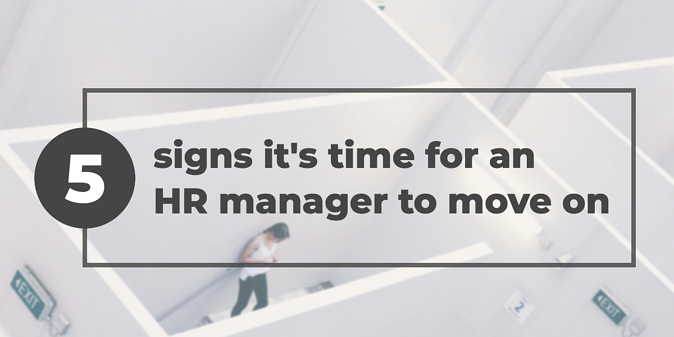 Luckily, many organizations understand the great value that HR professionals can bring to the table.